Our office is proud to have have 4 staff members with a combined 70 years experience in estate planning. 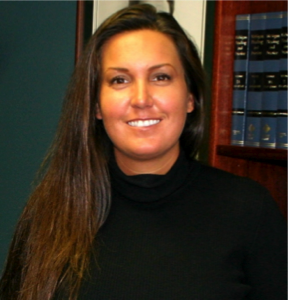 Aimee O'Bryan is our staff paralegal. She grew up in Lapeer County, and graduated from Dryden High School in 1993. She attended the University of Michigan and Oakland University. She has worked for the O’Bryan Law firm since 1993 and is Sean's main assistant and manages the office. Additionally, Aimee is responsible for a variety of legal responsibilities including all probate and court filings and drafting legal pleadings. Aimee also handles a variety of other responsibilities - when she isn’t chasing a house and barn full of animals. Sean and Aimee live on a small farm outside of Lapeer, Celtic Ridge. Sean and Aimee have two children, Caelán Patrick and Teagán Riley O’Bryan. Gina Shatley is the scheduling secretary and firm receptionist. Gina also handles client billing. Gina Shatley worked for EDS as an administrative assistant for thirteen years. Gina has also volunteered her time assisting a local animal rescue. Gina enjoys running and has run in the Crim Festival of Races and has completed several half marathons. She and her husband Keith live in Dryden and together have one daughter, Rachael. Karan DeWitt is the Communication Director at our firm. Karan assists with client communications, event coordination and various administrative duties. She is originally from Sheffield, England, is a graduate of Powers High School and the University of Michigan - Flint. She is the mother of 2 children, Lauren and Alan, and resides in Davison with her pet yorkie ZoE, and enjoys home improvement and gardening. Sean O'Bryan grew up in Lapeer County, Michigan. He was the 7th of 8 children, and 1 of 7 boys. His father, William O'Bryan, was a World War II veteran, and worked for the Fisher Body Division of General Motors. He died in 2004, at the age of 81. His mother, Mary Jean, was a registered nurse during the war, and homemaker, wife and mother. She died from Alzheimer's disease in 2009. Sean graduated from Almont High School in 1981, where he was active in Future Farmers of America and worked for the local newspaper, the Tri City Times. Sean completed his undergraduate studies at Central Michigan University, where he was elected student body president in 1985, and was an active member of the Beta Theta Pi fraternity. Sean attended law school at Texas Tech University, where he received his Doctorate in Jurisprudence in 1991, was a member of the Texas Tech Law Review and the Phi Delta Phi legal fraternity for honors students. He has also studied at several other colleges, including Michigan State University, the University of Detroit Law School, the University of Windsor (Canada), and the University of Texas. Always an active student of the law, Sean O'Bryan studies several hours each week, and spends many days each year attending professional conferences, including the annual Michigan Estate Planning Institute, to gain a better understanding of complex estate planning issues, and to stay on top of cutting edge planning options. Sean has worked at the well known Dallas law firm Fanning, Harper & Martinson, and the Texas Attorney General's office before coming back to Michigan, and beginning an estate planning law practice. Sean has written several articles on law technology and elder law and estate planning issues that have appeared in a variety of publications. Since beginning his practice in Michigan, Sean has personally handled over 5000 separate legal matters for more than a thousand local families. He has drafted over 3000 trust agreements, which will allow more than $900 million dollars to pass to families without probate. In 2005, Sean was among the first attorneys in Michigan to complete a certificate for advanced training in the Probate and Estate Planning Program sponsored by the Michigan Bar Association and the Institute for Continuing Legal Education. Sean is a member of the National Academy of Elder Law Attorneys, the Federalist Society, the probate and real property section of the American Bar Association, and the probate and elder law sections of the Michigan Bar Association. He has been an officer in the American Bar Association. He is admitted to practice before all the courts in the State of Michigan as well as the U.S. District Court for the Eastern District of Michigan and the U.S. Sixth Circuit Court of Appeals. Sean has been a member of the Board of Trustees, and is the current Chairman of the Four County Community Foundation in his original hometown, Almont, Michigan. Sean is also an active horseman, and is a member of the Lapeer County Mounted Posse. Sean was a past Vice Chairman of the Davison Downtown Development Authority, where he worked for the revitalization of Davison’s historic downtown. Sean is married to Aimee Lintz O'Bryan, a paralegal. Sean and Aimee have two children, their son Caelán Patrick O’Bryan and daughter Teagán Riley O’Bryan, who both attend the Chatfield School in Lapeer. They reside at Celtic Ridge, a small farm between Davison and Lapeer where they raise horses, sheep, goats, chickens, cats & dogs. They are members of the Huntsman Club in Metamora, Michigan, and they attend St. John the Evangelist church in Davison.